The presidential election of 2012 has been described by many as one of the most important elections in the last 30 years. Whether you’re a Democrat or a Republican, you should agree with that statement. I’ve shown many infographics depicting government spending and what kind of affect it will have on our future as well as the future of our children. Based on the importance of this year’s election, you could say that the act of voting is a gamble in itself. If you don’t already have enough on the line, you could place some real dollars on the outcome of the election on the prediction market site Intrade. Even if politics aren’t your thing, Intrade gives you the opportunity to test your luck on hundreds of different scenarios ranging from political elections to whether or not NASA will discover alien life by the end of 2013 (I’m not kidding). Apparently, there is a 12.5% chance that the latter will occur by the end of 2013. Basically, you’re buying contracts that predict an outcome. If you think that Mitt Romney will win the election, you can buy a contract and if he does in fact win, you receive $10. The $10 can be expressed as a percentage or a dollar amount, so $10 is also equal to 100%. If the odds are even, each contract in a two outcome scenario will cost $5 a piece – 50/50 odds. One will be worth $10 (correct outcome) after the event and the other will be worth $0 (did not happen). 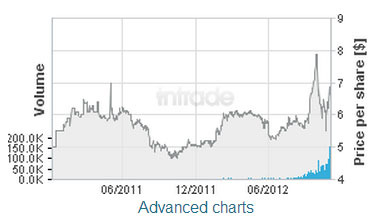 On Monday, the Obama contracts are selling for $6.81 per share compared to the Romney contracts at $3.19. In percentage terms, this translates to a 68.1% chance that Obama will win reelection vs Romney’s 31.9% chance at winning the election. Why don’t these numbers reflect the polls? Both candidates are practically dead even, yet the Intrade numbers are heavily in Obama’s favor. Is there some type of arbitrage at play here or are the polls more inaccurate than we’re lead to believe? I for one have never been asked how I’m going to vote for by a polling agency. That’s because I don’t have a landline and that is how most participants are reached; again giving weight to the accuracy claim. The risks are pretty straight forward – if the outcome that you bet on does not come true, you will lose your invest. You could always sell your contracts before the event occurs, much like stock options. For example, if the probability of an outcome is 50/50 when you buy the contracts, you will pay $5. Time goes by and the probability of your event occurring rises to 70%, leading to a profit of about $2 per contract. I love Intrade for the more obscure bets and the scenarios that don’t impact us in the way that a presidential election does. I’m the type of person that doesn’t bet on my emotions. By doing so, you’re doubling down and basically, not diversifying your emotional portfolio. Takes sports for example – I refuse to bet on my local team. If I bet that they will lose and they do, then I’ve won monetarily and lost emotionally. The outcome is even worse if you bet that they will win and they end up losing . You’re out the money and the emotional satisfaction of a victory. Whether or not you feel like betting on the election, Intrade surely has something for you. READERS: What is your favorite bet on Intrade? Why do you think that the presidential contract odds different so much from the polls we keep hearing about? I didn’t even see this until Henry Blodgett (sp?) pointed it out on Twitter around 8 pm. It’s interesting that InTrade did a great job of following the real numbers instead of the “it’s really close” talk. In hindsight, we should have seen Romney throwing long when he tried to put Pennsylvania in play. I thought about throwing some money on some Romney contracts because they were so cheap, but now I’m glad I didn’t. That chance of an alien life discovery has peaked my interest though. It would cost around $8.87 for a chance to win $10, but come on, alien life by the end of 2013?